The Temple of Hadrian is a temple to the deified Hadrian on the Campus Martius in Rome, Italy, built by his adoptive son and successor Antoninus Pius in 145 and now incorporated into a later building in the Piazza di Pietra (Piazza of Stone - derived from use of the temple's stones to build the piazza). It was once erroneously known as the Temple of Neptune. 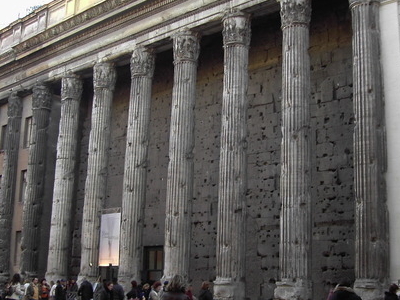 One wall of the cella survives, together with 11 of the 15-metre high Corinthian columns from the external colonnade, on a 4 m high peperino base. The fixing holes for its original marble covering can still be seen. This facade, along with the architrave (reconstructed after antiquity), was incorporated into a 17th-century papal palace by Carlo Fontana, now occupied by the Borsa bank. The building was octostyle and had 15 columns on each long side (4 have been lost from the surviving side). Inside the bank the remains of the non-apsidal naos can be seen, once covered by a barrel vault supported on columns between which were battle-trophies. The base of the columns had reliefs of personifications of the provinces of the empire (some of which are now in the National Roman Museum and Capitoline Museums demonstrating Hadrian's less warlike policy than his predecessor Trajan. The temple had a large square arcade surrounded by columns in giallo antico and which opened onto the Via Lata (now the Via del Corso) through a triumphal arch. This arch has been identified as the one called the "arch of Antoninus" in later sources, but has also been called the "Arch of Claudius" and the "arch of the Tosetti", from the name of the family that inhabited Piazza Sciarra (now disappeared due to road-widening of the Via del Corso). Despite having fallen into ruin and been demolished, the arch still gave its name in the 18th century to the 'Via dell'Archetto'. Here's the our members favorite photos of "Ruins in Rome". Upload your photo of Temple of Hadrian!